Copyright: Verge Magazine reserves the non-exclusive right to publish any entry and/or use any entry in related promotional material and related Verge Magazine products. All copyright and title to all submissions remains with the entrant in its entirety. 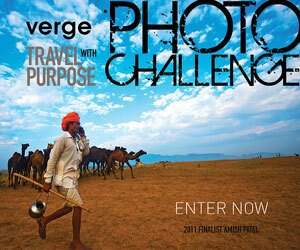 All entries must relate to meaningful travel. Grand Prize – The overall best in show will be awarded a prize of $1,00a0 Canadian. Category Winners – The winning image in each category will receive $100, a premium Rough Guide, a Verge t-shirt and subscription. Short-listed Images – Up to fifteen images in each contest category will be short-listed, for exhibition at the 2014 Toronto, Montreal and Boston Go Global Expos and for publication in the Photo Annual Edition of Verge Magazine. Image requirements: JPG format; minimum of 1500 x 2100 pixels or 3.1 megapixels.